Opening day is September 29th until October 31st. 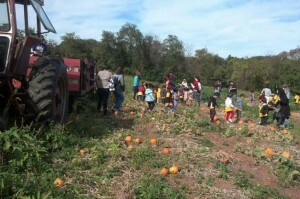 The cost is $6.00 per child which includes: A hayride to the pumpkin patch where they can pick your own pumpkin. To insure continued low prices, cash and checks only. Children can visit our barn yard where they can see all our farm animals. They can find their way thru hay tunnels, jump around on hay bales. Swings, slides, a extra large sandbox, teeter totters, and lot of other activities. There are plenty of props and settings for pictures, so don’t forget your cameras. We have a learning center which kids and adults can learn some some facts and see all the different types of grain and vegetable seeds grown right on the farm along with equipment used for for working at the farm. They will also learn of all of their different uses of the produce in their daily lives. Teachers are free and all other adults are $1.00 each on the hayride. If the adults and children wish to pick pumpkins in the field, the cost is $6.00 each. If you have a family or other group not scheduled, please come after 1PM during the week. Through the week we book school kids from 9AM till 7PM. We more than happy to book families or other groups anytime after 1PM. We thank you for your understanding. 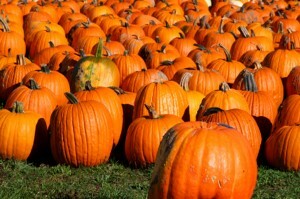 If you wish not to go on a hay ride, we have pre-picked pumpkins, ornamental gourds of all shapes, sizes, and colors. We have Indian corn, corn stalks, straw bales, scarecrows, mums, carving kits, and everything else you will need for your Fall decorating. We also have plenty of props and settings for photos opportunities to remember your visit, so don’t forget your camera. Cozy’s concession stand has lots to offer at the pumpkin patch. Goodies like home-made jumbo corn dogs, hot dogs, BBQ sandwiches, nachos, funnel cakes, soft drinks, fresh squeezed lemonade, and shaved ice / snow cones. For groups of 10 or more, snow cones are just $1 each and is a great treat for the kids after playing… If you want to purchase a lunch special for a group, please contact Tracy at 501-351-4460. If it’s raining or rain is possible, please call ahead to see what activities are being held that day.